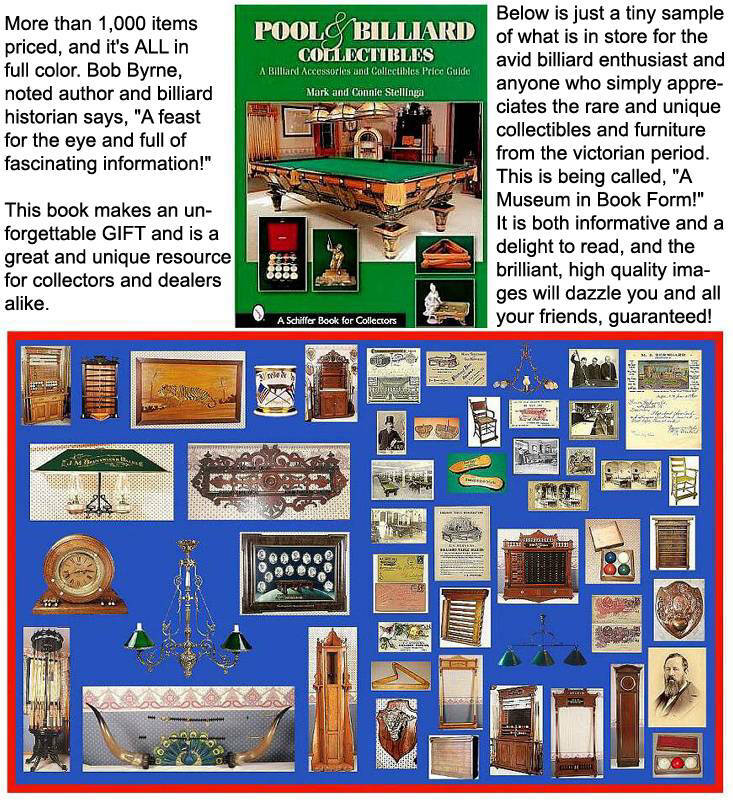 Let us know if you would like to purchase a copy of our new book, "Pool & Billiard Collectibles", a price guide for antique billiard collectibles and accessories. It features hundreds of rare items from our 30 years of collecting and experience in this field. More than 1,000 items priced, in over 800 full color images! Email or call now to purchase your personally autographed copy of the first book ever written on this subject. What you see above is just a tiny sample of the many types of hard to find billiard items you will see in this 288 page, hardcover, original work. There is currently nothing else like it available anywhere. Priced through us at $76.00, including U.S. postage, we would be happy to take your order today. Sure to be a collector's piece. Our phone number is: 319-331-1949 (cell), 10 AM to 7 PM, any day, Iowa time, (The phone WILL take a message.) Our email address is: billiard@avalon.net Thanks, Mark & Connie. Price: $76.00, incl. US postage. $85 for Canada and overseas. Personally autographed, and dedicated to whomever, if requested.